One major issue that is likely to occupy the attention of members of the federal legislature as they resumed plenary this year is the consideration and eventual passage of the N6.08trn 2016 Appropriation Bill presented to the joint session of the National Assembly late last year. Interestingly, an indication that the gulf between legislators of the ruling All Progressive Congress (APC), which is the majority party in the House and the People’s Democratic Party (PDP), became more visible as lawmakers from both parties view each other with suspicion during the consideration of the 2016 – 2018 Medium Term Expenditure Framework (MTEF) and Fiscal Strategy Paper (FSP) presented by the Federal Government. The passage of the MTEF is a prelude to what to expect when debates and further legislative actions commence on the 2016 budget proposal at the committee level and finally during plenary. While approving the MTEF and FSP, members of the House differed with their Senate counterparts by deleting two of the recommendations in the MTEF and FSP; namely, the implementation of the Treasury Single Account (TSA), with E – Collection platform by the President Muhammadu Buhari administration and also rejected the request that arrears of the 2015 fuel subsidy for domestic consumption as proposed in the MTEF be sustained. Sparring partners in the debate in the House are mainly, the House Leader, Hon Femi Gbajabiamila and the Minority Leader, Hon Leo Ogor. Expectedly, Hon Ogor, who was the arrow head of a section of the lawmakers opposed to the original recommendation prepared by the APC-led administration, said instead of the executive carrying over the arrears of the 2015 subsidy claims to 2016, the administration should explore the liberty it enjoys to request for a supplementary budget in the event there is a short fall in funds for subsidy payments. While the Minority Leader had his way in respect of the two proposals that were rejected, Hon Gbajabiamila ensued that the House passed the template contained in the MTEF/FSP document by approving the $38 per barrel benchmark and a daily crude oil production quota of 2. 2million barrels for the 2016 budget, just as it mandated the Central Bank of Nigeria (CBN), to initiate measures to close the gap between the parallel market and the official exchange rate, including the projected expenditure of N5,720.34 billion to be realized from non-oil revenue in 2016. Besides, members of the House ad hoc committee on non-implementation of the 2015 Appropriation Act have expressed dismay over the handling of the fiscal plan, especially the 2015 budget and the public debt by the Ministry of Finance. After the spat between APC and PDP lawmakers over the MTEF and FSP document, an apparent sign of deepening mistrust between lawmakers from the two main political camps emerged when the House unanimously adopted a motion calling for the probe of the non-implementation of the 2015 Appropriation Act by the Buhari administration since taking over power on May 29, 2015. While appearing before the ad-hoc committee set up by Speaker Yakubu Dogara to look into the nonimplementation of the budget, Director-General of the Budget Office of the Federation, Alhaji Aliyu Gusau, who represented the Permanent Secretary in the Ministry of Finance, Mrs. Anastasia Nwaobia, said the country’s domestic debt stood at N8.396 trillion as at June 2015 while external debt profile as at the same period was $7.04 billion for the Federal Government and $3.42 billion for the 36 states and the Federal Capital Territory (FCT). Reacting to the Budget Office presentation, the ad-hoc committee Chairman, Hon Aliyu Patiegi (APC-Kwara), described it as very sketchy and did not give a holistic view for a full understanding of how the 2015 budget had been implemented, saying; “We had expected you to provide vivid insights into the regime of import duty waiver, using explanatory notes to describe what was done and why. You have not done that and we cannot say for sure that the position you presented before us is the right one because each day, companies keep declaring profits running into hundreds of billions and yet they are given incentives and waivers, when sectors such as the textile industry have no such consideration for revival.” He therefore advised the Ministry to present details to the Committee to avoid going back and forth with explanations on key aspects of the federal government finances. Pategi added; “On our debt profile of N8.396 trillion, we are interested in knowing who the federal government is indebted to, what necessitated this huge amount of borrowing as well as how this money so-borrowed was spent. We also want to know from when to when did this debt accumulate and how this amount will be liquidated in both the short and long term”. Then came the D-day when President Buhari arrived the National Assembly complex, accompanied by chieftains of his party and a retinue of ministers and aides. At exactly 10.01am, the president was ushered into the House chambers, venue of the joint session. In his 34 minutes address, Buhari began by apologizing to Nigerians over the biting fuel scarcity throughout the country as experienced during the period then. The president castigated market speculators and stakeholders, who are resistant to change, for causing the artificial scarcity and gave assurances that the shortages would end soon. On the N6.08 trillion budget proposal, he said the government has raised capital expenditure from N557billion in 2015 to N1.8 trillion in the 2016 budget, adding that 30 per cent of this year’s budget will be committed to capital expenditure even as the government is projecting to realise N1.4 trillion as revenue from non-oil sources. He also disclosed that his administration is projecting a revenue target of N3.86 trillion for 2016 and recurrent expenditure of N2.43 trillion and plans to spend N1.66 trillion on foreign and domestic debt servicing, borrow N1.9 trillion. Expectedly, he assured that he will fight corruption no matter how long it takes. During the presentation, President Buhari received intermittent ovation from members of the National Assembly. Significantly, the Appropriation Bill now before the National Assembly for consideration and passage means different things to different lawmakers, depending on which party they belong. An APC House member from Imo State, Hon Austine Chukwukere described the 2016 Appropriation Bill as a fruitful budget, saying that it will stimulate and engineer the economy in such a way the infrastructure deficit that the country had experienced under former administration will now receive a boost from the Buhari administration, adding that the capital expenditure profile increase will lead to improvement in dilapidated infrastructure throughout the country as well as industrial revival. The lawmaker, who is Deputy Chairman, House Committee on Finance, expressed confidence that if fully implemented, the budget will kick-start the economy for the good of all Nigerians. Similarly, in the opinion of Hon Philip Shaibu, representing Etsako Federal Constituency of Edo State on the platform of APC, the budget will make poverty a history in 2016. He said the emphasis on job creation and improved education is a welcome development, adding that employment creation will empower Nigerian youth. Shaibu, a former Majority Leader in the Edo State House of Assembly and a one-time President of the National Association of Nigerian Students (NANS), said the budget as presented by President Buhari is a clear departure from what obtained in the past where government borrowed money to finance its recurrent expenditure. According to him, “I see our economy booming; I see the economy being restructured. Poverty issue will be totally addressed. I am optimistic.” In his own reaction, the member representing Bali/Gassol Federal Constituency of Taraba State, Hon Garba Chede, said the budget is a product of deep thinking based on present realities facing the nation. He said, “This is the first time the APC administration is presenting a budget and this budget, undoubtedly, is a creation of deep thinking based on realities, which were obvious to all Nigerians.” But opposition lawmakers are not that cheerful over the budget and are keeping their game plan close to their chest. Commenting on the possibility of passing the budget as presented by the President, House Minority Leader, Leo Ogor, said President Buhari should know that what he laid before lawmakers are “mere proposals” which would undergo some form of tinkering or amendment by the National Assembly. He declared; “What we have before us are mere proposals. Nothing is sacrosanct. That is why we are the legislature which has the power of appropriation. The proposals will be subjected to thorough overhauling, taking into cognizance the current economic realities of the country and our revenue expectations from funding sources”. 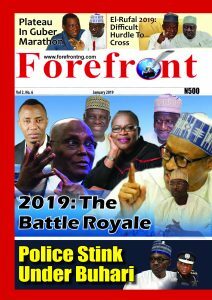 However, there are strong indications there might be a re-enactment of the bickering between the National Assembly and the Presidency over who has authority to tinker with the budget just like it was witnessed during the era of former President Olusegun Obasanjo. Another impending feud may be over the $38 oil benchmark adopted in the budget proposal against the backdrop of predictions by the International Monetary Fund (IMF), which states that oil prices will fall below $20. Lawmakers opposed to retaining the oil benchmark argue that when the Medium Term Expenditure Framework for 2016-2018 was forwarded to the legislature, the price of oil was pegged at $38 but it is now $35, far below the benchmark, thus all assumptions on the 2016 budget in their estimation have changed. Here, Forefront has it on good authority that members of the House in key committees, such as Appropriation, Finance, Aids/Loans/ Debt Management expected to work on the budget proposal, are already exchanging ideas on how to arrive at a realistic oil benchmark. Giving credence to this position, Chairman of the House Committee on Media and Public Affairs, Hon Abdulrazak Namdas, said he heard complaints from his colleagues on the crude oil benchmark; the cuts in allocations to the National Assembly and the Judiciary. He however said the House is yet to take a position as it relates to grumblings by lawmakers, even as he said the budget will not go back to the President for assent the same way it came to the National Assembly without it being thoroughly overhauled. According to him; “While it will be hasty to jump to any conclusion because the National Assembly is yet to receive details of the 2016 budget from the Finance ministry, it is hasty to say, yes, we will increase this allocation or reduce that one. No, I can’t say so now. But, one thing is certain, no budget ever returns to the executive the way it came to the National Assembly”. Other areas of differences between the House members and the Executive is the public disclosure and what seems like an open castigation of the National Assembly by President Buhari over plans by federal legislators to buy over 400 new vehicles estimated to cost tax payers over N4.7 billion at a time the nation is facing serious cash crunch and the refusal of the legislative arm of government to subject its financial operations to new policy of Treasury Single Account (TSA). This posture has drawn the angst of some lawmakers who wonder the rationale behind the President’s attempt at blackmailing members of the NASS over the purchase of new vehicles, when presidential aides, chief executive of MDAs and senior civil servants ride in more expensive and exotic official cars. Expectedly, budget implementation is another area that is likely to generate friction between the executive and legislative arm of government. Already, Speaker Dogara has specifically made known the legislature’s intention to strictly monitor the implementation of the budget through oversight when he delivered the vote of thanks during the budget presentation. He said; “we wish to give notice that oversight will be diligent, thorough and intensive. Recent developments, especially what is known as ‘Dasuki Armsgate’ have proven that oversight must include, not just project implementation, but also the security and sanctity of unspent budgeted funds.” “On our part and in the spirit of change that has come to this legislature, we promise Nigerians to hold Mr. President to every word, line and provision of the budget when passed and assented to”, the Speaker posited.